Losing weight can be a long process — especially if you have more than just a few pounds to lose. If you’re in a hurry to drop extra weight, it can very tempting to try quick fixes, diet pills or supplements. Many times these products don’t work and could pose a serious health risk. Aiming to lose 20 pounds isn’t a small goal, but can be accomplished fairly quickly with the right dietary and lifestyle changes. One of the primary keys to losing weight quickly is to control what you eat. Decreasing your intake either by controlling portion sizes or counting calories works well for quick weight loss. Portion control is sometimes the only thing you can control. If you’re eating out or subjected to meals controlled by someone else, portions are the one thing you can control every time. Estimate your calorie intake and usage. Pay attention to what you eat and drink throughout the day, and note amounts of each item as best you can. This can show you how much you currently eat and how many calories you can cut out of your diet safely. To speed up the process, you can try cutting your calories to the lowest amount of calories that’s considered safe for most people — 1200 calories daily. However, this amount may change based on your activity level, gender, and weight. It’s wise to discuss this amount with your doctor to make sure 1200 calories is safe and appropriate for you. 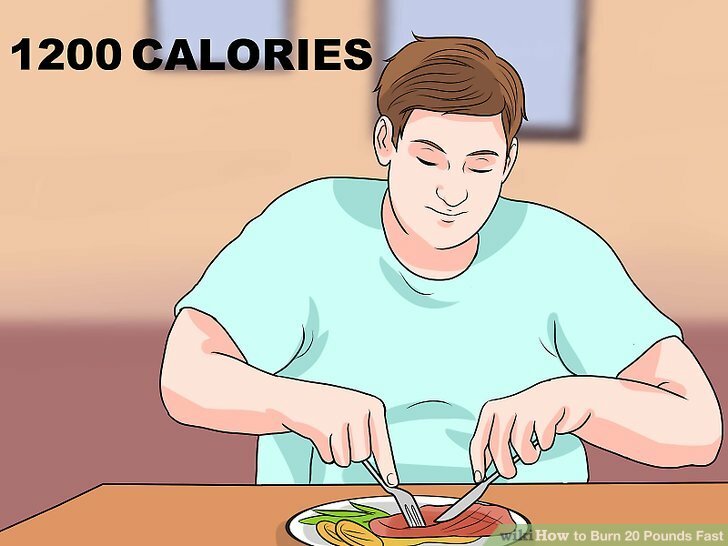 If you cut out about 500 calories daily that generally leads to about one to two pounds of weight loss per week. Consuming less than 1200 calories daily can put you at risk for nutrient deficiencies and may result in slower weight loss over time. Prepare menus and snack ideas that will fit into your calorie goal. Having a set meal plan can help keep you on track. In addition, it can help keep you on track since you’ll know exactly what all your meals and snacks are. Spend some time coming up with a meal plan for the week. Be sure to include all meals and snacks you plan on eating throughout the day. 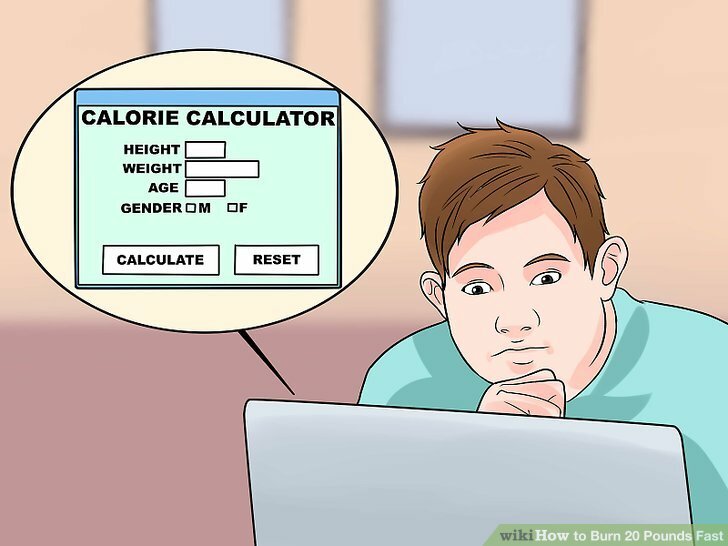 You can use online calorie calculators to find out the typical number of calories for foods or meals that you want to include on your diet. Double checking this can help make sure you stay within your calorie limit. Studies have shown that low-carb diets result in quicker weight loss compared to low-fat diets or very low-calorie diets. Limit your carbohydrate intake to help reach your desired weight loss goal quickly. Carbohydrates are found in a variety of foods including: grains, fruits, starchy vegetables, legumes and dairy products. Low carb diets may have some initial side effects. They are not dangerous or unsafe, but may make you feel a little off. Typically, you may experience headaches, hunger, crankiness or fatigue. There are a variety of commercial low carb diet plans that are based on different levels of carbohydrates. Find a program that’s most appropriate for you if you don’t want to design one for yourself. Focus on lean protein, fruits and vegetables at most meals. When you’re limiting carbohydrates in your meals and snacks, you’ll need to focus on lean protein, vegetables and fruit. This diet pattern will help keep you satisfied and support quick weight loss. 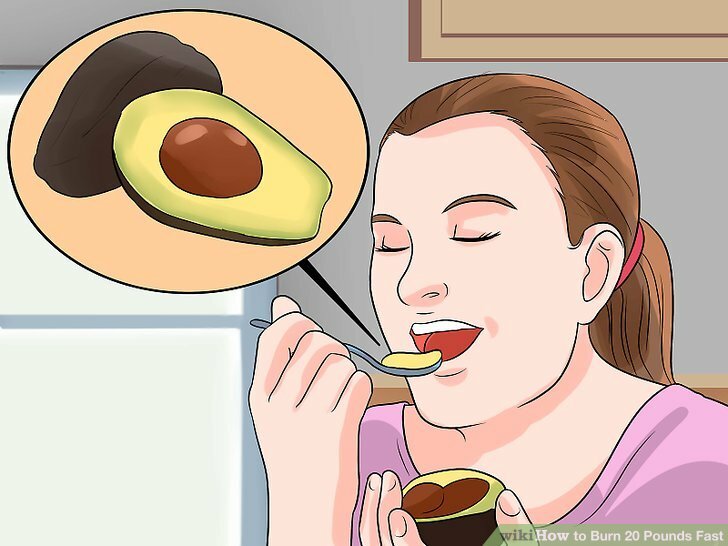 You’ll also want to incorporate healthy fats into your diet. Choose lean protein foods at each meal like: pork, eggs, poultry, seafood, lean beef, legumes, nuts and tofu. Choose a variety of fruits and vegetables daily. Include one to two servings at each meal. Although fruits and some starchy vegetables do contain carbohydrates, they offer you a wide variety of essential nutrients like fiber, vitamins, minerals and antioxidants. These are appropriate to include even on a low-carb diet. Healthy fats include avocado, nuts, seeds, olives, olive oil, and coconut oil. Examples of meals include: cottage cheese and fruit; lettuce wraps with deli meat and cheese, plus a handful of raw vegetables; kale salad with grilled salmon; or grilled pork tenderloin and mixed vegetables. 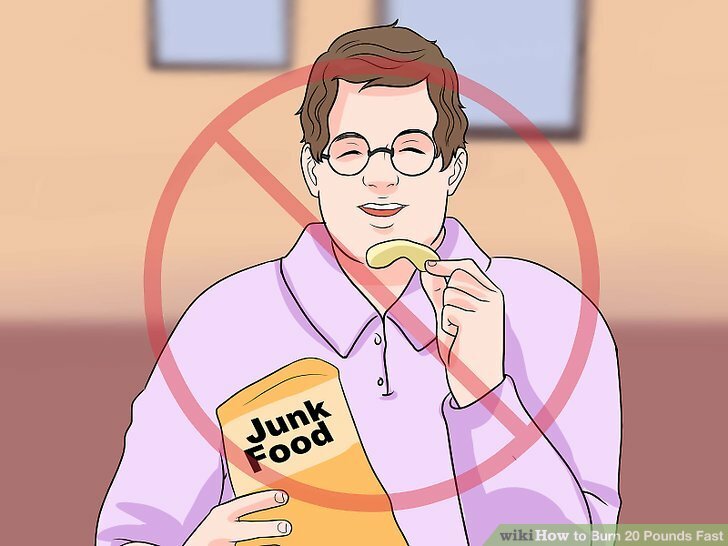 Avoid high-fat foods, added sugars, and processed junk food. These types of foods are typically higher in calories and can slow or stop your weight loss. In addition, they are also typically lower in essential nutrients like vitamins or minerals. 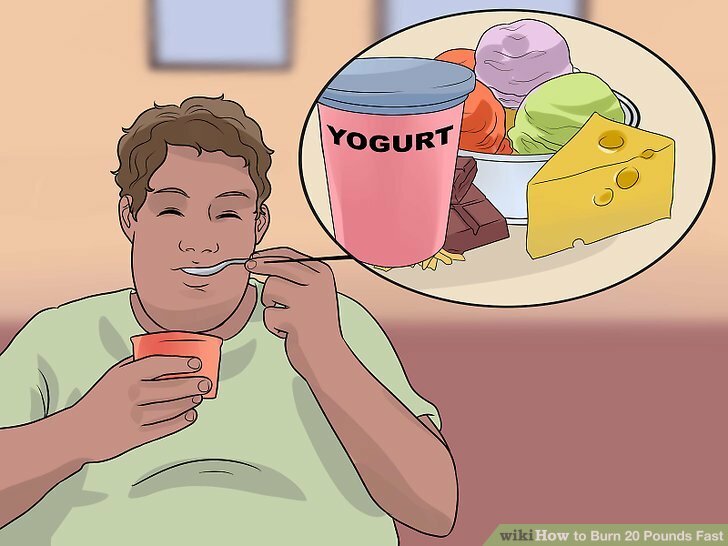 If you’re interested in losing 20 pounds quickly, you’ll need to cut out completely or severely limit extra snacks or treats. Limit foods like: sweets or desserts, chips, crackers, sodas, sweetened coffee drinks or sweetened tea, and pretzels. Also avoid alcoholic beverages. These do not provide any nutritional value and are only extra calories. Even if you fit these types of foods into your calorie limit, you may be missing out on key nutrients from other, more healthy foods (like protein, fruits or vegetables). Saving up calories for sweet treats that are lacking in nutrition may slow weight loss. The best way to lose weight quickly is a calorie controlled diet and exercise. 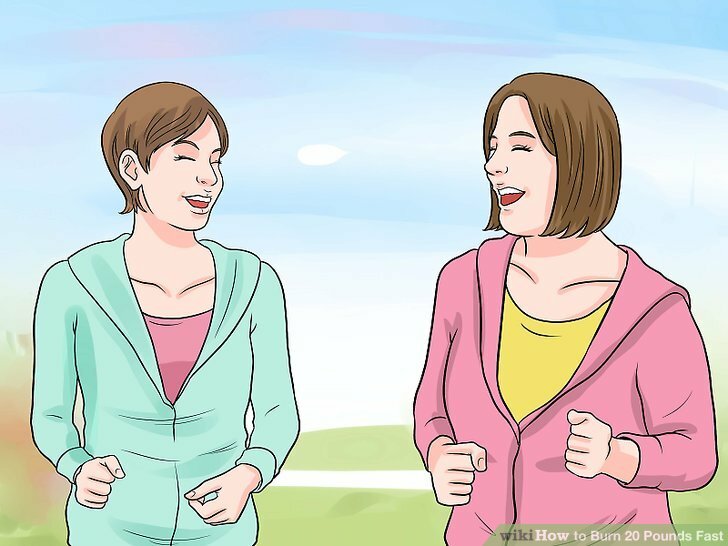 You will need to participate in a fairly intense exercise regimen to burn a significant amount of calories to help you lose 20 pounds quickly. Vigorous exercise is any activity that significantly raises your heart rate and breathing pace. You shouldn’t be able to say more than one or two words at a time without taking a breath. On the perceived exertion scale you should be around a seven or eight out of ten. 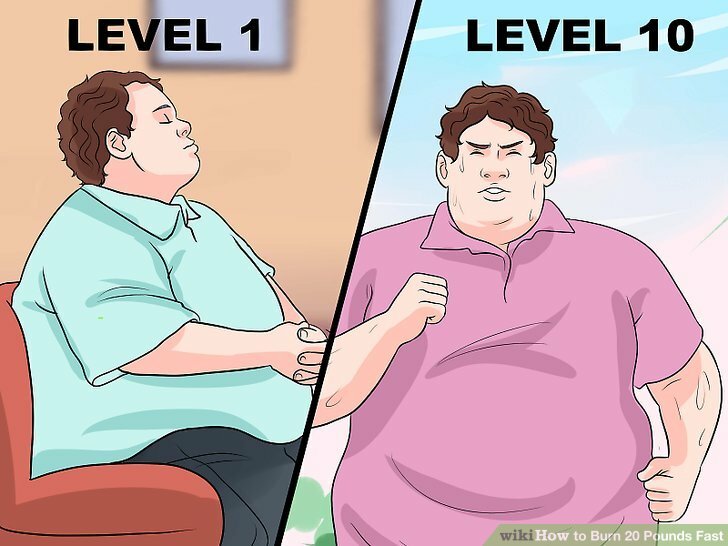 Level one is sitting and ten is the most intense exercise you could perform. Set aside about an hour every day. Plan to be active for an hour most days, even if some activities are less strenuous than others. Moderate intensity activity will also burn calories and support weight loss. However, vigorous intensity activity burns more calories and may help you reach your weight loss goal quicker. Prior to starting any exercise routine, it’s important to meet with your doctor to make sure exercise is safe and appropriate for you. You should aim for a minimum of 150 minutes of cardio weekly. However, it’s recommended to get up to 300 minutes or five hours weekly for increased weight loss. Common cardiovascular exercises include running or jogging, swimming laps, dancing, cycling, and certain martial arts. 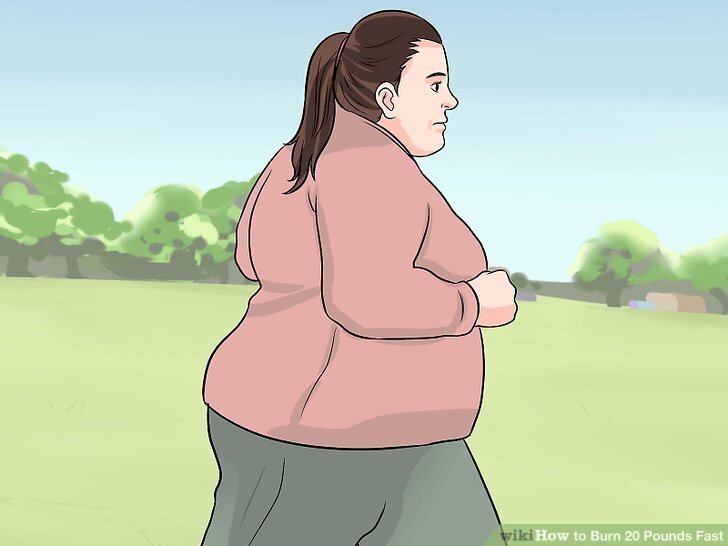 These activities burn differing numbers of calories per hour, but all of them are effective. Strength training is a healthy and highly effective type of exercise for weight loss. It will help increase lean muscle mass, which over time, can increase your body’s natural ability to burn calories. 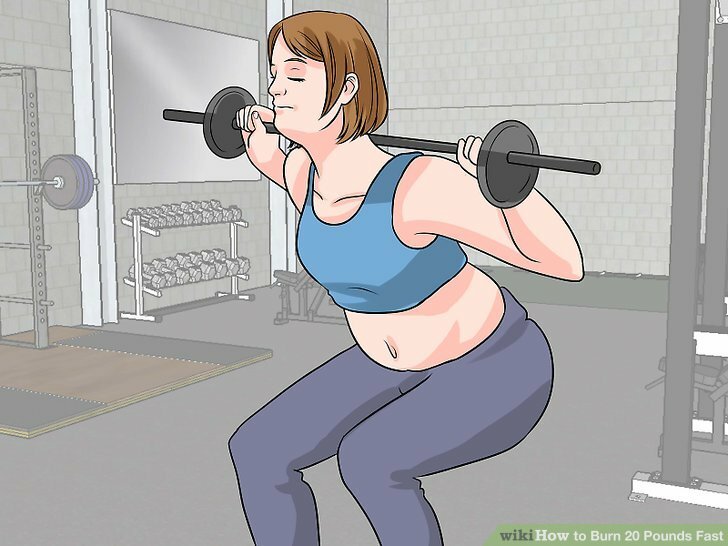 Weight training is invaluable for any weight loss program, because stronger muscles require more energy to operate, which means that they burn more calories. Include about two days of strength training for at least 20 minutes a session. Exercises include: weight lifting, weight lifting classes, body weight exercises and pilates. Plan one to two rest days. Taking a break from exercising is a crucial part of a workout schedule. Continually working out, especially at vigorous intensities, is a lot of work and stress on your joints, muscles and body. Rest days help your body recover and can help prevent injury. Stick to rest days just as religiously as you stick to your workouts. Rest days should still be active. That means staying off the couch and participating in light, low-impact, low-intensity activities. These can include: restorative yoga, light walking, or a leisurely bike ride. Tracking all your foods and meals will not only help you stay on track, but can be motivating to you as well. Seeing how well you’ve done and well you’ve stuck to your diet plan is exciting. Many of us believe we are eating less than we really are. 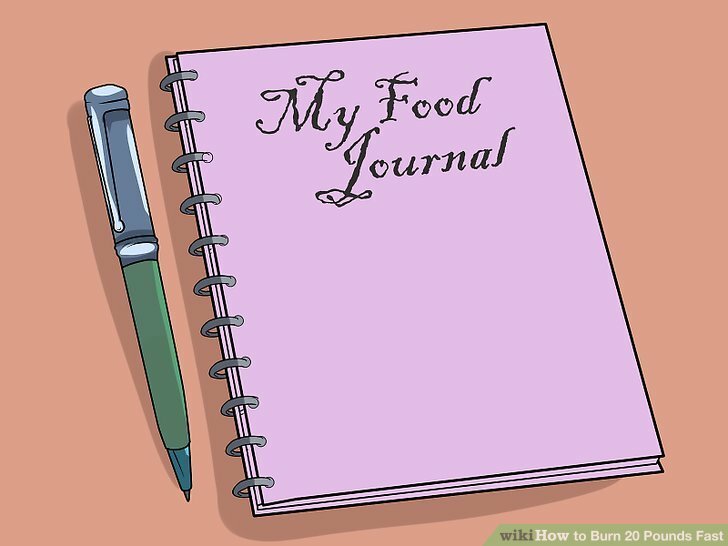 Food journaling is a fool-proof way to ensure that you are holding yourself accountable. Grab a notebook or download a diary app to your smart phone. Jot down notes about your meals (including calorie intake), exercise, and other measures you’re keeping track of. You can also use your journal as a diary. Taking note of how your diet is making you feel, writing about difficult days, etc. 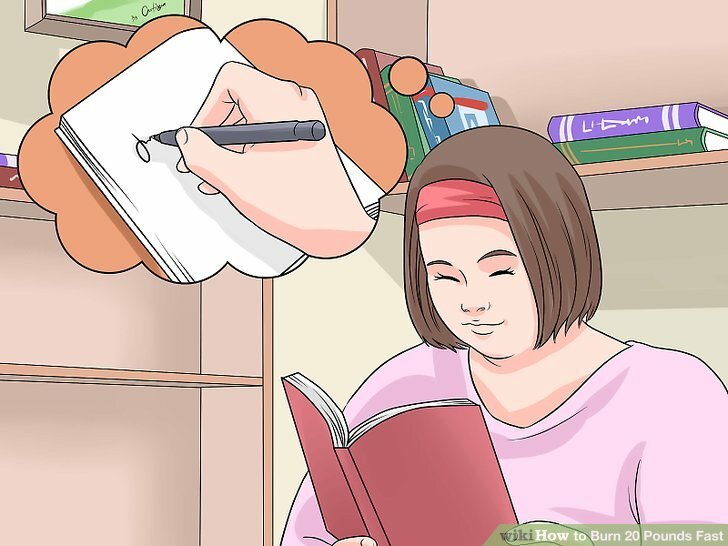 Write down your goal and leave it somewhere you can easily check it again. Underneath your goal, keep a weekly log of how many pounds you’ve lost or how many inches you’ve lost. When you feel like giving up, read over your goal and the progress you’ve already made. This may be the motivation you need to keep yourself going. Keeping track of your weight can also provide you with some insight into how well your diet is working or if it’s not working. You’ll be able to discern when it’s time to make a change. 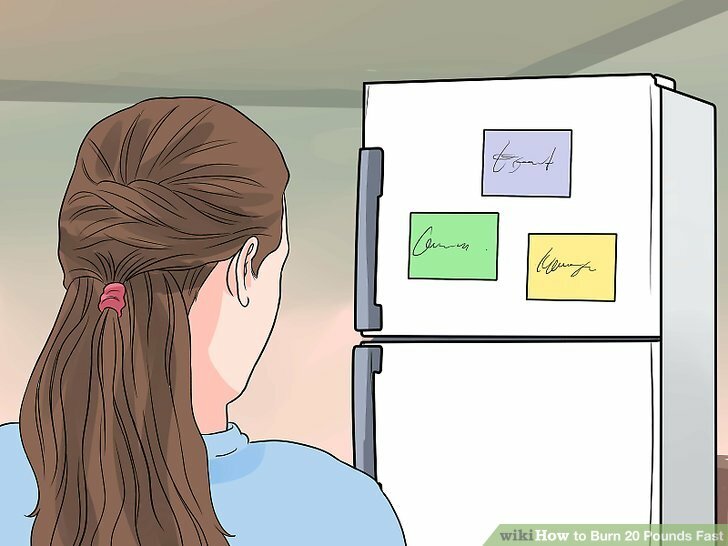 Post sticky notes or taped scraps of paper wherever you will see them often: the bathroom mirror, the refrigerator, even the steering wheel of your car. Write short motivational phrases and reminders on them. They’ll give you a bit of a boost throughout the day. Little positive sayings can help you remember your goal, keep you focused, and help you stay on track. This is especially useful in helping to maintain your exercise schedule. If you have an exercise partner, you have a reason beyond yourself to show up to every session on time. He or she can give you a boost of enthusiasm when you’re not feeling up to your workout. Your partner can also lend a good ear when you’re feeling down or unmotivated with your diet or progress. Stress can make it hard to stay on a diet or exercise plan. Managing stress can help you stay motivated and feel energized throughout your diet program. Extra stress can slow weight loss and even promote weight gain. Getting it under control can help support quicker weight loss. It’s important to find activities to help calm and relax you. Try chatting with friends, going for a walk, listening to music or reading a good book.